One topic that frequently stumps people is deciphering megabits and megabytes. “Bit: short form for binary digit. It is either a 0 or a 1 (binary code). 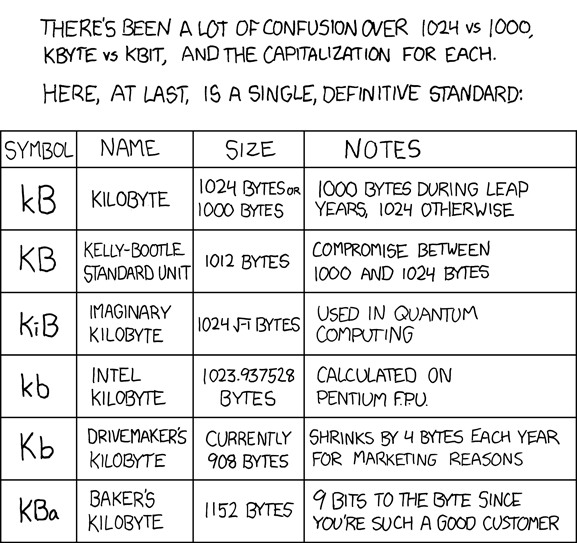 1 kilobyte = 1000 bytes. 1 megabyte = 1000 kilobytes. 1 megabyte=1024*1024=1,048,576 bytes and 1 byte=8 bits, and 1 megabyte (1048576) is just 8,388,608 bits, then 1 megabit is approximately .125 megabytes. According to the binary system, used in relation to computer storage and memory, it takes not 1000 bytes to equal a KB, but 1024 bytes. This is because 24 extra bytes are used to store indexing or mapping information about the 1000 bytes of data. Data transfer rates are quite handy for gauging performance levels of various hardware devices. We must also translate speed to value when considering Internet service plans, advertised by download and upload speeds expressed in kilobits per second (kbps) For example, a typical Digital Subscriber Line (DSL) plan might have an upper transfer limit of 1,500 Kbps, which can also be expressed as 1.5 Mbps. A cable plan might be advertised with speeds up to 5,000 Kbps or 5 Mbps; and fiber optic Internet can reach speeds of 50 mbps or more.